Get away ... from everything. When it's time to escape from the hustle and the bustle of your everyday life and finally spend some time in serenity, the Loess Hills are your destination. Unique, breathtaking scenery ... original, authentic, "down-home cooking" ... remarkable attractions ... and most of all, peace. Situated along Iowa's western border, the Loess Hills National Scenic Byway passes through a unique land formation that is up to 15 miles wide and about 200 miles long from north of Sioux City, Iowa to near St. Joseph, Missouri. So...what are the Loess Hills? They are hills made almost entirely of windblown soils. Toward the end of the last ice age, winds picked up soils that had been ground as fine as flour and formed dunes along the ancient waterway that became today's Missouri River. The process repeated itself during the thousands of years the ice age took to end, enlarging the dunes. Because the prevailing winds were from the northwest, the dunes on the Iowa side of the river were higher than those west of the Missouri. ​Today, the definition of a Loess Hill is a hill made of loess that is more than 60 feet in height; using that definition, about 640,000 acres of land in western Iowa constitute the Loess Hills landform. Although deposits of loess are found across the world, nowhere else but China are those deposits higher than they are in Iowa. Eventually, topsoils evolved on the dunes and a unique natural community developed. Ice age animals like wooly mammoth, camel, giant beaver and giant sloth roamed the Loess Hills during the Hills' early years. Humans have lived here off and on for 6,000 years as evidenced by stone tools, spear points, pottery and burial sites. The Loess Hills National Scenic Byway is coordinated by Becca Castle at Golden Hills RC&D. Becca's email is rebecca.castle@goldenhillsrcd.org and phone is 712-482-3029. 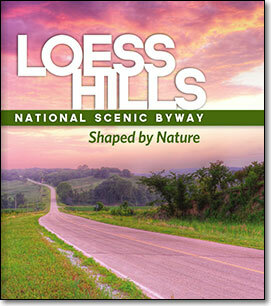 Click on the image above to view the Loess Hills National Scenic Byway Guidebook (opens in new tab), or click here to download a pdf. Click here to download a pdf of Western Iowa's Loess Hills coloring book by Pam Cates & Liz Bisbee.